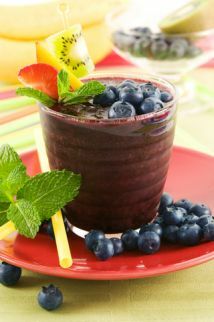 Blueberry Smoothie Recipes Can Help You Lose Weight and Protect Your Eyes! It’s True! Try These Scrumptious Blueberry Smoothie Recipes! These blueberry smoothie recipes have become my favorite over the years. While working at a smoothie bar, I quickly realized that berries were the number one choice of most people. A blueberry smoothie is such a powerhouse of nutrients! Fueled with intense antioxidants and phytonutrients that will vitalize your body. Berries are naturally lower in sugar than other fruits, like oranges for an example. I have found that my diabetic friends can handle drinking healthy blueberry smoothie recipes much easier than the other fruit smoothies. But don't be fooled with the low sugar content... Blueberries add a great flavor to any smoothie. Show off YOUR smoothie recipe! Check out more about awesome blueberry nutrition! First, pour the cashews, coconut milk, dates, stevia, and water into the blender and blend. Second, put berries and ice into the creamed mixture. Blend until the desired consistency. First, pour water and juice into the blender. Second, place the pear on the bottom with the rest of the ingredients on top. Blend on low for 10-20 seconds. Then increase the speed to medium/high until creamy smooth. First, pour water and juice into the blender. Second, place the banana and stevia on the bottom with the frozen fruit and ice on top. Blend on low for 10-20 seconds. Then increase the speed to medium/high until creamy smooth.